u m a m i: Madam, would you like some hairy cheese? Madam, would you like some hairy cheese? This is a typical breakfast served at our hotel. 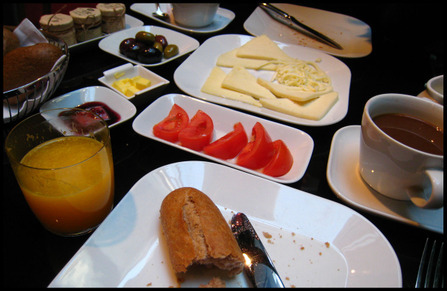 Freshly squeezed orange juice, breads, cheese plate of white cheese and stringy white cheese, tomatoes, olives, butter, white cheese with cherry preserves and more honey and spreads in little pots. Eggs are available too. In the beginning we ate everything, then just the eggs and on our last few days only coffee and juice. Much like in England and our love-hate tango with their full English breakfast. As we can tell from breakfast the Turks love cheese. Most of their cheese are white, in big no-nonsense chunks and also in bags of ropey strings which the vendor grabs and pulls. And always, outside the cheese stalls in the markets, is one of the above mystery object. I touched it- it is really animal hair. The vendor would then offer a small chunk of the cheese that is matured inside this ?goat cavity, the cheese is like feta- crumbly, chalky (in a good way), salty, grassy. On the second day we played tourist. For two hours at the Topkapi Palace, plenty enough already so we went on all the way to Nisantasi to shop for carpets. I bought a very big rug which on hindsight is rather too big for our sitting room but I could not resist the unusual blue green colours, as well as a colourful runner. Therefore on the second day we had a mission to buy a foldable sac to contain the rug. The Grand Bazaar was not much use, it is big and the architecture is a marvel and all that but to us it was just an overgrown souvenir shop. It is also not far from the Egyptian Bazaar, and on the way we walked through a wholesale market area for luggage and found our cheap collapsible plastic bag. Mission accomplished, we entered the treasure cave that is the Egyptian Bazaar. It is known as a spice market but is much much more. There are lots of spices, especially good for tracking down sumac, olives, teas, kebab seasonings and also unusual things like hollowed out dried eggplants and even Iranian caviar if one is so inclined. 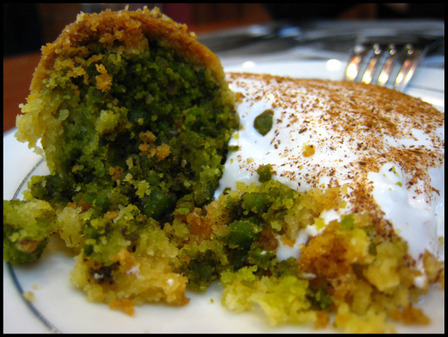 We discovered Turkish pistachios, the stuff that is in all the pastries and cookies out there. The shopkeeper pooh-poohed the idea of Sicilian pistachios, to him only the Turkish and the Iranian stuff are superior. 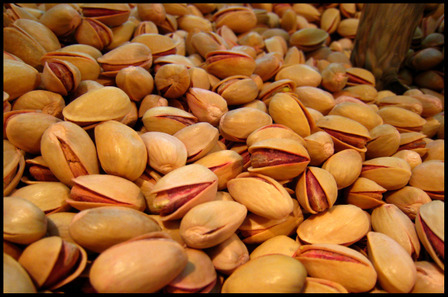 We were not going to disagree, his pistachios were small, prettily pink-skinned, lightly seasoned and highly delicious. Other than spice shops and lokum displays, the other predominant stalls sell spicy beef called pastirma and more beefy sausages. My first encounter with pastirma was at Changa where we dined on our first evening, following Chubby Hubby's recommendations. The restaurant is the last word in hip and cool, the waiters wear LCD badges which displays their names like an electronic ticker tape. We sat on the first storey, where there is a transparent opening in the floor to allow diners to see the action in the kitchen below. The food was firmly fusion and most dishes cram many seemingly incongruous ingredients together. As expected with inventiveness and fusion foods some creations work better than others. In a restaurant with such staying power (it has been around since 1999) it obviously has more winners than losers and on the whole our meal was rather enjoyable. Hits for us included a starter of scallops, pastirma and hummus which is an inventive twist on the rather more traditional bacon-wrapped scallops, also a very excellent dish of roasted lamb with red cabbage, sumac, pomegranate mollasses, peanuts and braised apple, and a stunning dessert of pear poached with chilli pepper and red wine served with milk mastic ice cream and snowed under with their local fairy floss pismaniye. Roasted salmon miso, coconut sauce, rose petals and coriander would have been better if they used fresh coconut milk, the packaged creams always sink whatever they're served with. Still, the most incredible thing we ate there was the breadrolls. Innocuous looking but when bitten and chewed up, it releases the aroma of rose petals, startling and delightful, leaving me to wander how they managed such an extraordinary feat. 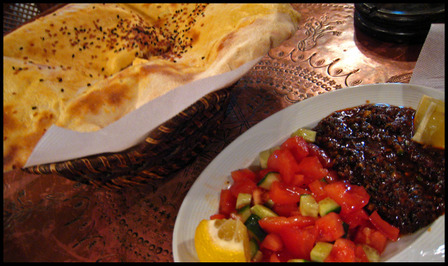 Strolling through and around the Egyptian bazaar can make one very hungry indeed. We were not sure what to have for lunch and hoped for the best by going for the restaurant above the bazaar itself, accessible by a steep staircase from the short end of the L-shaped building. Bab-i-Hayat serves doner kebabs and sandwiches in a casual cafe below but upstairs it is expansive with many tables, cushioned canapes and soaring tiled ceilings, all rather splendid. 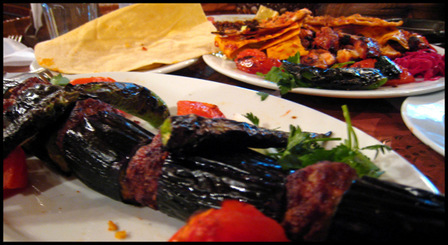 One can select items from a buffet of hot and cold dishes or order from their menu of grilled meats. We pointed and got a plate assembled with rice, stuffed aubergines, chickpea beef stew, mini-raviolis and more stews and braises. Delicious and helped to fill the stomach until our mixed grill arrived and that was rather good too even though the meats looked like it could benefit from a longer time on the grill. 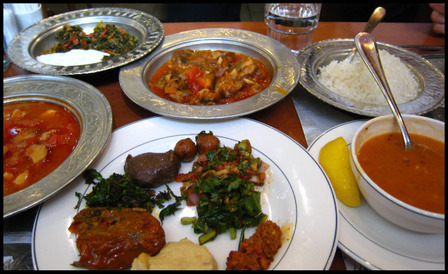 Most of our restaurant recommendations came from Chubby Hubby and Istanbul food blogger Cenk of Cafe Fernando. 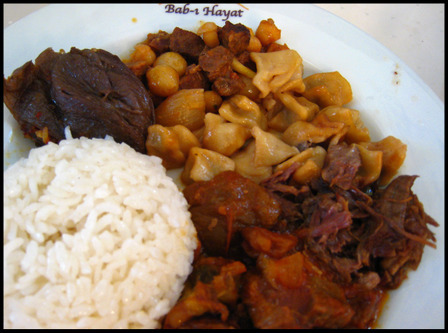 One evening when we did not have any place to go to and a kebab place that was lauded in that week's TimeOut was fully booked, we asked the receptionist to recommend something and he suggested Haci Baba. He even had their brochure to show us. 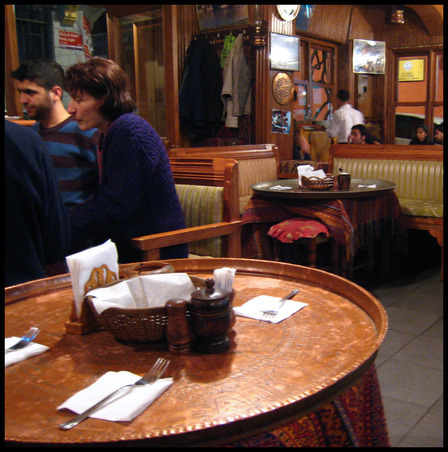 We duly made our way there and found ourselves in a large restaurant with traditional decorations and every table occupied by tourists. Uh oh. To give them benefit of doubt, we ordered some dishes. Cold vegetable appetisers passed muster but when our main courses arrived we knew we had been conned. Our kebab plates looked like something a child can put together using their wooden pieces of food toys, you know, the type with the big slit in the middle for the pretend knife. My chicken fillet, which I had ordered because they were out of grilled aubergines, looked like a flattened blackboard eraser with fake grill marks and was woefully underseasoned, it's neighbours an espresso cup sized portion of rice, four, yes dear god, four pieces of pallid undercooked French fries and one thumb-sized grilled pepper could not quite fill up the plate. Husband's lamb shish-kebabs were no better, the cubes looked brown but tasted microwaved. I almost cried, this was not my idea of a Saturday night dinner. We felt bad about wasting food but decided to cut our losses and take our chances elsewhere. Just around the corner from their rear exit we came across a corner sofrasi which I think is a Turkish word for home-style restaurant. Medi Sark Sofrasi (Istiklal Caddessi, Kucukparmakkapi Sok, 46A Beyoglu IST T: 0212 244 90 56-57) was occupied by three-generational Turkish families, young couples, the local toughies, we were the only foreigners until a group of savvy french speaking ladies walked in. Inside it feels like opium parlor, Bedouin camp and backpacker cafe all mixed up. Seating is on shared canapes and a large copper-tooled tray served as a table. The menu is short, I ordered the grilled aubergines and husband the mixed grill. While waiting, we munched on freshly baked flatbread. It arrived in a big pouf and deflates after being punctured by impatient fingers. To scoop fresh tomato and cucumber salad or to dunk into a dynamite-hot spread. Haci Baba nightmare receding, we started to enjoy our evening. The aubergines were smoky and melty, the skin charred so one has to scrape the flesh away and dollop them on breads or smoosh on the minced meat kebabs, I swooned on the first mouthful. Everything on the mixed grill plate was fabulous, from the red cabbage salad, parsley raw onion salad, various pides and obviously the grilled lamb and chicken pieces. The chicken drumlets were especially finger-licking good. The proprieter's girlfriend/wife/ lady friend came in and proceeded to eat bread and a huge bowl of salad. Just when I thought this is how Turkish ladies keep their figures, she started on a hefty plate of kebabs while the proprieter hugged a generous portion of said chicken wings. We cleaned up our plates and ate up the bread, then reclined on the chairs with full bellies and were able only to ask for tea to finish before waddling back to our hotel. 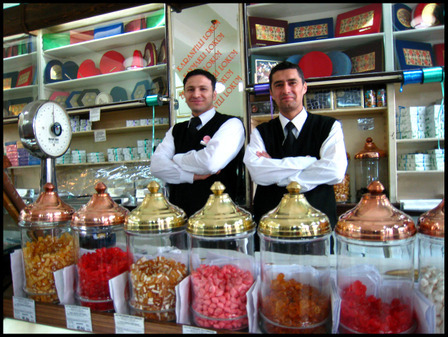 Haci Bekir is a well-known purveyor of lokums otherwise known as Turkish Delights. They have a small outlet on Istiklal Caddessi but we found a much warmer welcome in their outlet at the Asian district of Kadikoy, accessible by a 20 minute trip from Eminonu pier. Kadikoy on a Saturday morning was especially festive, there is a lively market and a few hundred pastry shops. The staff are quick to offer samples and before we knew it, we were tucking a few boxes of pistachio lokums for people back home. The shop is just opposite Baylan patisserie which Cenk mentions as famous for their icecream confections but we were saving our tummies for the main reason of the trip i.e. Ciya Sofrasi, so we only bought some chocolates. 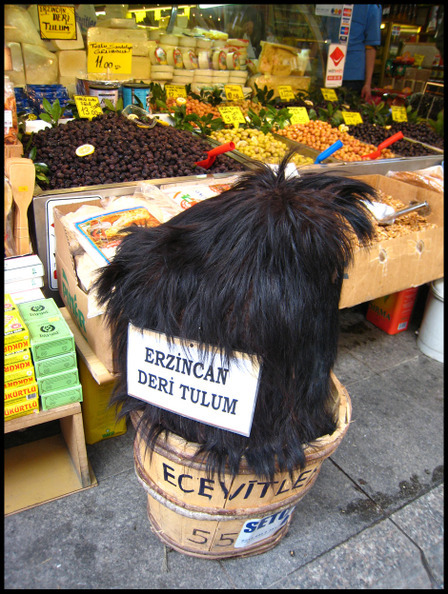 There is actually three Ciyas along the Guneslibahce Sokak which is the main path as you wander along the market. Ciya Kebabs serve mainly kebabs and there is a cafe-kebab-sofrasi two doors down but we plumped for Ciya Sofrasi because I remember that in his blog Cenk mentioned a buffet area comprising a cold/ dessert bar on one side and a hot food/doner section on the other. Everyone coming in passes through the buffet turnstile and spends agonising minutes deciding what to eat, we did our usual point and hoped for the best. And it was amazing. 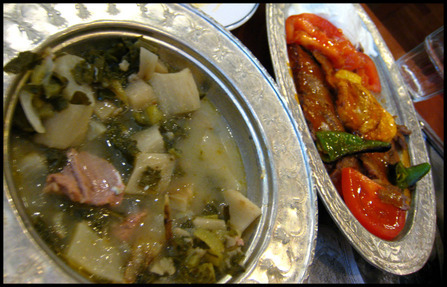 The specialty is Anatolian cuisine which means not much to us, but it doesn't need a lot of knowledge to appreciate their various slow-braised meat dishes, the unusual wild vegetables, the clean flavours and the subtle aromatics. The cold buffet section is mainly vegetarian, we much preferred the hot dishes, somehow meat enlivens a stuffed aubergine like no amount of spiced and herbed rice can. 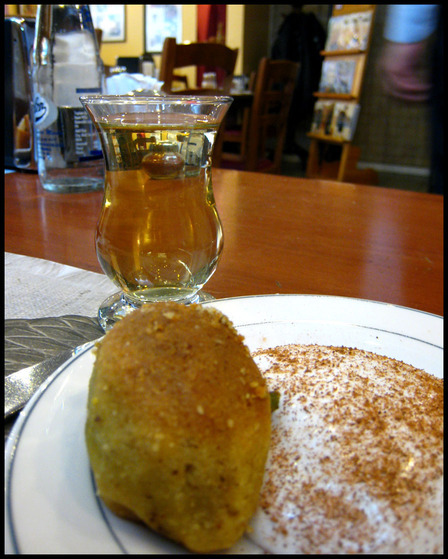 We had to save room for dessert, in particular kerebiç which Cenk endorse wholeheartedly as something which would form part of his last meal. It arrived as a large cookie with a splodge of cinnamon covered sticky meringue like substance; Cenk explains that the splodge is made from a special foam from a special tree that also aids digestion. Tea in the background is made with oregano. The cookie crumbled to reveal mucho ground pistachios. It was salty yet sweet, nutty and crumbly. Meant to be savoured slowly, with or without the foam which I didn't quite take to on account of the cinammon topping, accompanied by more tea of course. Seriously good, simple yet very sophisticated. Other diners were digging into slices of candied pumpkin and we so wanted to have a slice too but the stomach was filled to the brim already. Never fear, for the next day we went to another place, heartstoppingly beautiful, and another palace, this time drop dead stunning, and we got our greedy forks into pumpkins and other yumminess. But that's a story for another post, now is a good time, I suggest, to scroll back up and drool at the pictures again.